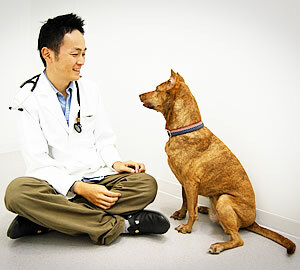 West Cross Veterinary Hospital : English-speaking vet at Nakameguro, Tokyo. Welcome to West Cross Veterinary Hospital. Living in a foreign country can make life challenging and sometimes difficult. I know what that is like because I lived outside of Japan for several years with my dog. At West Cross Veterinary Hospital, we can be the bridge between you and your pet. We can help you with all of your pet's medical needs. And we can communicate with you in English. We will send back the fixed reply to your e-mail address within a few days. Please call us if the reply does not reach you. In the case of any emergency, please contact us by phone. 5 minutes walk from "Nakameguro" , or 10 minutes walk from "Daikan-yama"
Copyright (c) ウエストクロス動物病院（目黒区青葉台・犬 猫） All Rights Reserved.